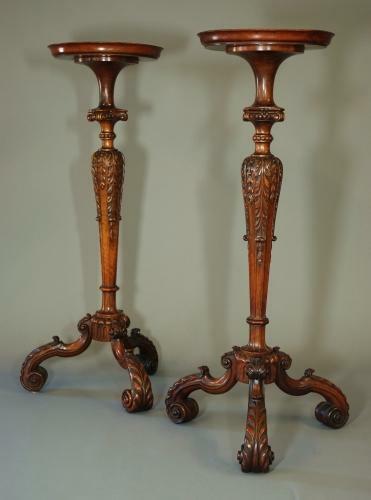 A pair of late 19thc superb pair of walnut torcheres with fine carving. The tops are circular & moulded with a curl walnut veneer inset. These are supported by turned & tapered stems comprising of a carved Grecian Ionic capital leading down to a carved ball beaded decoration. The stem continues down to a superbly carved fluted acanthus & husk design. The base is reeded & supported by three scroll shaped legs with acanthus carving terminating with iscroll feet. These pieces can be used as stands to hold vases of flowers or for displaying pieces of sculpture. These are of sound construction & can go straight into a home.